The stock is now trouncing the broader market by 33 percentage points in the last year. 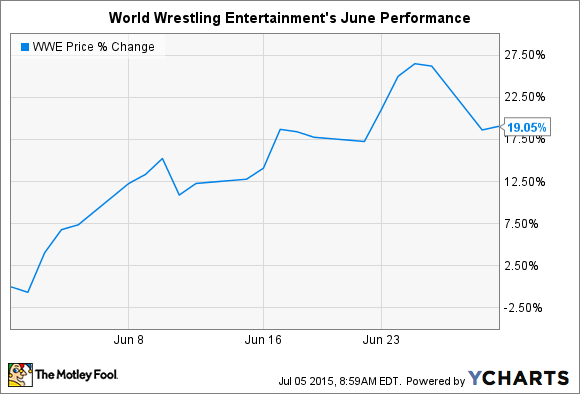 What: World Wresting Entertainment's (NYSE:WWE) stock soared 19% in June, according to S&P Capital IQ data. The jump put shares of the media giant at a 38% gain over the past 52 weeks. The stock is now trouncing the broader market by 33 percentage points in the last year. But shares are extremely volatile, having logged a 40% drop this year as well. So what: World Wrestling Entertainment is currently between quarterly earnings releases -- it last announced results on April 30. But investors received a few pieces of optimistic news on the business last month. The company in mid-June launched a new YouTube channel aimed at video-gaming fans. "UpUpDownDown" offers five shows per week and will leverage WWE's massive social-media presence to deepen engagement with the brand. It already serves over 5 billion YouTube video views annually and boasts more subscribers than any other sports channel on the service, suggesting the channel could quickly establish a big audience. "We're poised to make an immediate impact with this new channel," said company executive Lisa Fox in a press release announcing the launch. WWE's stock also caught an eye-popping upgrade during the month, as investment firm BTIG Research gave it an aggressive target of $25 per share, representing a further 50% gain. Now what: It's anyone's guess whether the stock will surge toward that goal or suffer another quick drop. That's because this year's results will be driven by the company's unproven subscription WWE Network. The young service reached an average 927,000 customers last quarter, up 29% over the prior year thanks to a successful WrestleMania event. However, while they're confident that the service will keep growing, management isn't at all sure whether those gains will come in steady increments or with large, seasonal swings. That's why their official forecast calls for a huge range of potential results: WWE is forecasting anything from 1 million to 1.3 million second-quarter subscribers, which would translate into adjusted earnings of between $1 million and $11 million. The wide range of business outcomes points to more swings ahead for this volatile stock.